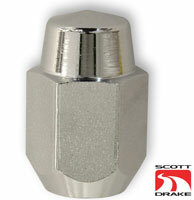 Exact reproduction of Magnum 500 Chrome Lug Nuts. These lug nuts are just a bit taller than our HB-101 lug nuts. Pointed tip like the originals.